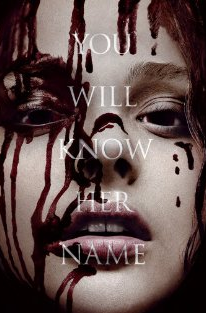 My first horror movie of 2015 –> the remake of Carrie, based on Stephen King’s first published novel. I will always like the book better than the movie (Stephen King constant reader here). But the original movie of Carrie is one of the few works based on his novels that I actually like and have watched again and again. Sissy Spacek was that part. This new movie aggravates me because of bringing in modern-day electronics that did nothing for the story and weren’t carried through realistically. If a YouTube video like that was posted it would have gone viral and I can imagine the aftermath of public outcry and lawsuits – in minutes. The scene with Chris and her dad with the principal was silly. Also it seems there are no residents on Carrie’s street save the one scene with the boy on a bike. But I do like the scene when her mother is driving her home from the famous “plug it up” shower fiasco. The scenery shows a poor neighborhood that I think she and her mother would have lived. I knew the special effects would be better. The original Carrie was in the 70’s and effects have gone so much farther since then. They did take it over the top at the prom with no added benefit I feel. With the original Carrie, less was better. I got more of the character holding the scene and making me feel emotions for poor Carrie White, which is what the book did. I was glad, but could not understand why they cut the original ending scene. Sue in this movie could have never done the moment justice. That “Carrie White gotcha moment” at the end – I love it. I love it also in Friday the 13th and other horror movies. Those endings always set up a later. A later discussion among friends, a later “sleep disturbance”, a later movie. All in all, if not judged against the original, it was a decent movie.